The Saramonic 1-Person UHF Wireless Lavalier Microphone System has everything you need to record one subject to your smartphone, tablet, computer, or camera. Ideal for a variety of audio-for-video applications, this bundle includes the SP-RX9 dual-channel wireless receiver/mixer, one bodypack transmitter, one omnidirectional lavalier microphone, a versatile cable set, and more. The receiver boasts a built-in clamp for securing your smartphone, and a removable padded hand grip for enhanced stabilization during handheld use. Thanks to auto-scan, infrared sync, and easy-to-see displays, the system empowers you with simple setup and efficient operation. The transmitter is powered by two AA batteries (available separately), while an internal rechargeable Li-ion battery powers the receiver. Connect your favorite headphones to the receiver's 3.5mm headphone jack for convenient audio monitoring. You can also connect wired microphones directly to the receiver, then take advantage of its audio mixing capabilities en route to your recording device. 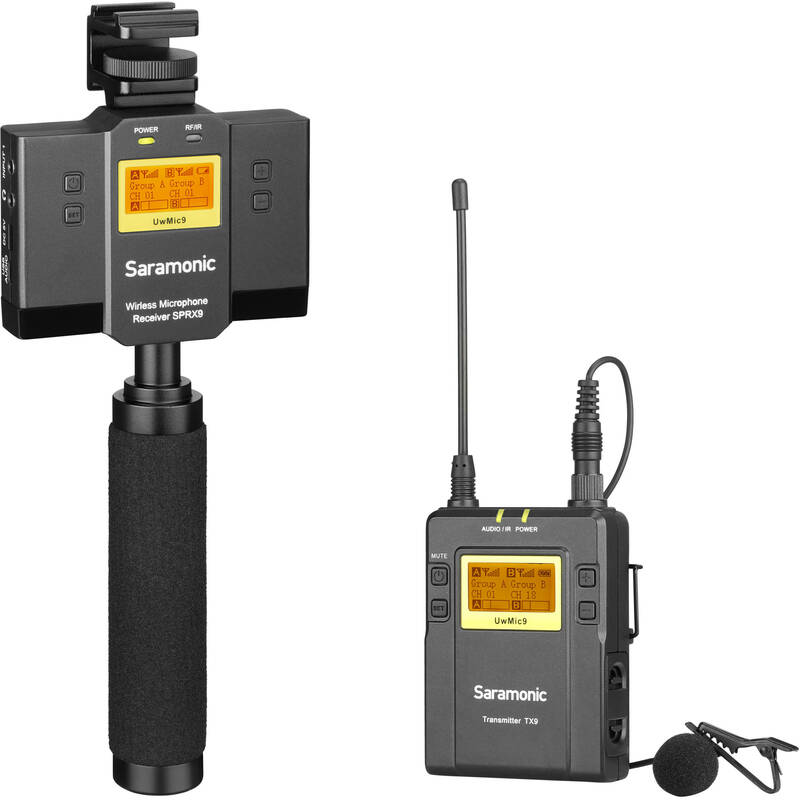 Record two wireless or wired microphones into your iOS/Android mobile device, Mac/Windows computer, or DSLR/mirrorless camera with the Saramonic SP-RX9, a UwMic9 Series dual-channel UHF wireless receiver/mixer designed for mobile journalism, video production, live streaming, and vlogging. With 96 selectable channels across the 514 to 596 MHz frequency band, auto-scan, and infrared syncing, the SP-RX9 provides reliable wireless signal reception up to 330' away from your transmitters. A built-in clamp securely holds smartphones from 2.6 to 3.3" wide. This receiver/mixer provides phantom power to its TA3M mini-XLR input and plug-in power to its two 3.5mm inputs, allowing it to accommodate wired microphones such as a shotgun or two lavaliers. Use the two 3.5mm outputs to simultaneously route audio to headphones and the 3.5mm input of your camera. The SP-RX9 can be powered by its long-lasting internal rechargeable battery or via an external USB battery pack (available separately). It includes a removable stabilizing handle and a versatile cable set with micro-USB to Lightning, micro-USB to USB Type-C, USB Type-C to USB Type-A, 3.5mm TRRS, and mini-XLR to XLR cables. The TX9 96-Channel Digital UHF Wireless Bodypack Transmitter with Lavalier Mic from Saramonic is a compact transmitter that employs a crystal-controlled PLL synthesizer. It can be used when paired with an RX9 receiver (sold separately) to capture audio for interviews, broadcast TV, electronic news gathering (ENG), and other audio broadcasting and recording applications. Featuring 96 channels in two groups, an easy-to-read LCD display, over 330' operating range, a mute function, and a BMP-type 1/8" mic input, the bodypack transmitter has an RF power output that can be switched among high, middle, and low settings. It is designed to capture rich, crystal-clear sound and includes a lapel clip, and a windscreen. Box Dimensions (LxWxH) 12.6 x 5.4 x 2.5"
Box Dimensions (LxWxH) 9.2 x 4.7 x 2.8"